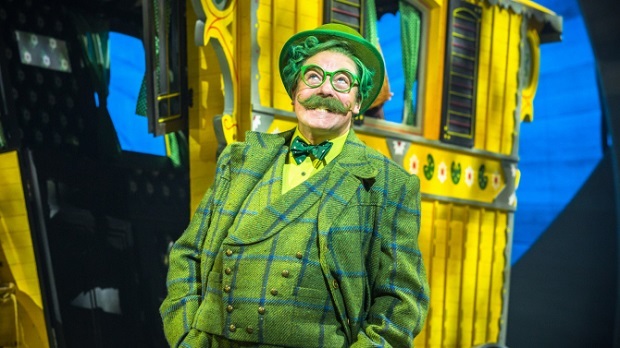 "wonderfully endearing and vocally beautiful"
After undergoing several workshops and a tryout tour across the UK, Stiles and Drewe's brand new musical The Wind in the Willows poop-poops into the West End for limited summer fun. It's the well-known story adapted from Kenneth Grahame's classic riverside tale, following Mr Toad and his insatiable need for speed, and boy, does this outing do it justice. Landing on the London Palladium stage is no easy feat; one of the largest theatres in the West End, only the biggest shows dare to put their names above the door. It's the creative team and the starry cast that are a big draw, reuniting the group behind the charming Half a Sixpence and introducing comedian Rufus Hound, mixed with stage favourite Simon Lipkin. The cast themselves are excellent; Hound is brilliantly bouncy as the greedy Toad, Lipkin gets in plenty of one-liners to appease the adults in this family-oriented show, Craig Mather is glorious as the brave and friendly mole, and Neil McDermott provides lots of comic relief in a rather revelatory performance as sneaky Chief Weasel. At the core are a wonderfully dedicated ensemble, from the family of hedgehogs to a tap-dancing pony, all of whom look delighted the whole time. There's something in the show for everyone. Geared toward a family outing, the musical pays homage to the original children's tale, with Stiles and Drewe's surprisingly memorable score adding much of the fun. Most of the songs are wonderfully endearing and vocally beautiful to listen to; “Messing About in a Boat” is lovely, whilst “A Friend is Still a Friend” is genuinely tear-jerking. It sets out to melt the heart of even the stoniest theatregoer. Aletta Collins' fun and snappy choreography ensures the whole stage is filled, particularly in “We're the Wild Wooders”, whilst Peter McKintosh's woodland design weaves the action together nicely, also managing to cinch in the vast Palladium stage. The whole show is incredibly fun. There's humour, a very complementary score that has you humming on the tube home, and a cast who are enjoying every moment. It's the perfect summer treat that carries a heart-warming message of friendship and hope. It's lovely. So lovely, in fact, that it would be worth getting in your motorcar and speeding on down to London. Poop poop!